Saint Max & The Fanatics // Album Launching! 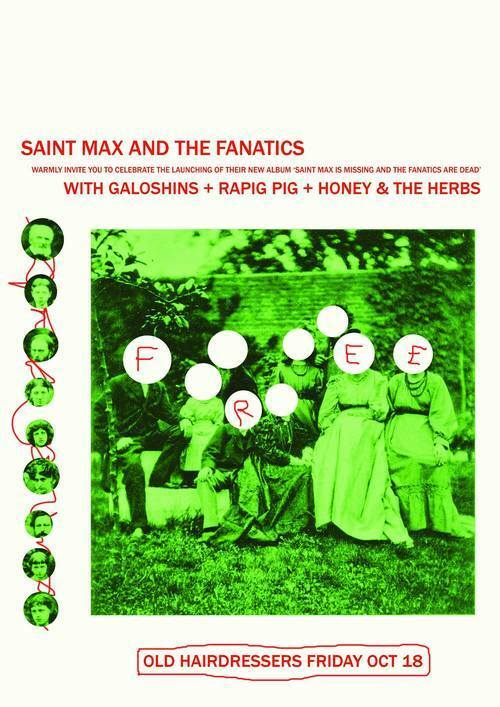 Saint Max and the Fanatics are gearing up for the release of their debut album on Monday 21st October with two launch shows in Scotland’s central belt. The first of which is TONIGHT in EDINBURGH. The band will be joined by label-mates Chris Devotion and the Expectations plus Colonel Mustard & The Dijon Five and The Blue Ship in Henry’s Cellar Bar. It’s free entry (infinite +1s! ), starts at 8pm and ends by 11pm. Spitfire stylee! Then TOMORROW night the band are in GLASGOW with label-mates Galoshins, plus Rapig Pig and Honey and the Herbs making up the bill. This one is at The Old Hairdressers and again is a total free for all! Naturally amongst the frolics the album will be on sale so please do bag yourself a copy. If you can’t make a show (oh the shame!) then you can still get your mits on the album right HERE.